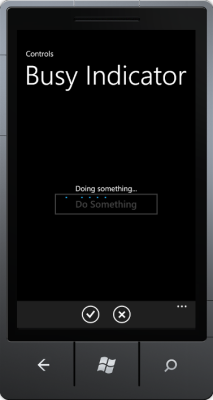 This blog post introduces a Busy Indicator control for Windows Phone 7, which can be driven/defined by XAML and allows binding of the busy state via a ViewModel property. This control can be defined around arbitrary page elements and handles the visibility of the application bar, as well. 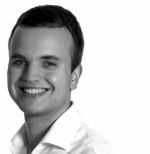 Indicating the busy state is a common task of applications, that perform many actions asynchronously, while remaining responsive, like Silverlight and Windows Phone applications. It’s up to the developer to show the busy state in dependency of an operation and to disable parts of a page, which should not be selectable/changeable in the meantime. For Windows Phone 7 there are some solutions, but I was surprised that I couldn’t find a satisfying one for me. Either the level of control was inadequate (for example giving users the possibility to change/select controls) or the busy indicator was set/initialized directly from code (code behind/ViewModel), which is more kind of an anti-pattern for me. 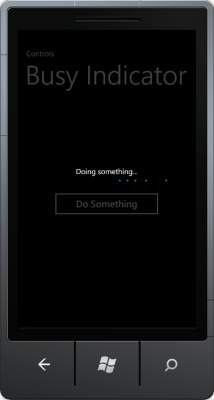 Thus I decided to look at my favorite busy indicator control for (web-target) Silverlight and to port it to Windows Phone 7. My implementation of the busy indicator consists of 2 components: the BusyIndicatorControl as core part and the BusyIndicatorStyle in the Styles.xaml for the layout. 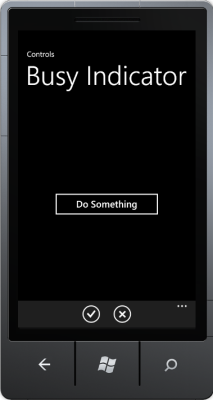 The implementation uses the PerformanceProgressBar from the Silverlight for Windows Phone Toolkit (Feb2011 or newer), so make sure you’ve installed it. The usage of the BusyIndicatorControl is fairly simple. In your XAML just place the control around those controls, which you want to set to „busy“. Bind the IsBusy property to your ViewModel/code behind property, set the BusyText and that’s it! Optionally, with HideApplicationBar you can indicate if you want to show or hide the application bar, when IsBusy==true. <TextBlock x:Name="PageTitle" Text="Busy Indicator" Margin="9,-7,0,0"
<Button Content="Do Something" Height="80" Width="300"
In this case, the whole phone page would be set to „disabled“ by the overlay of the busy indicator control and the application bar would hide, when the IsBusy property is set to true. IsBusy is bound to a property IsDoingSomething in the ViewModel, which controls the visibility and state of the busy indicator. Of course, you can choose the area to disable and change the property values and the style of the control as you want. Definition on arbitrary parts/controls of a phone page. Control through data binding, e.g. from ViewModel (busy state and text). Creates an overlay over controls, that should be updated. Option to hide the ApplicationBar, when the indicator is busy. I have been working with this for two days now. Is it possible to save this control in a class library? I have tried adding the template to a generic.xaml inside of a themes folder to no avail. I keep „Unknown Parser Error..“ What am I missing? Hi. With „Desktop“ do you mean WPF or Metro-apps with XAML/C#? Currently I’m diving into Win8 Metro and thus I could take a look on this.